Named after the date the group was formed, 7/27 is the sophomore album from female-powerhouse group Fifth Harmony, scheduled for release on May 20th via Epic/Syco. The album features the lead single "Work From Home (feat. Ty Dolla $ign)." 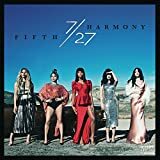 The new record builds upon the success achieved from their debut full-length release, Reflection, which earned them two platinum singles, "Bo$$" and "Sledgehammer," as well as the double platinum single "Worth It." Among their many accolades the ladies were honored at Billboard s Women In Music event in 2015, receiving the "Group of the Year" award. There is no slowing down with Fifth Harmony and 7/27 is sure to take the group to new heights. This deluxe version contains 2 additional tracks.